We appreciate deeply your decision to get our new service - "Purchase your airplane ticket On-line" on our website. We are glad to inform you that each time you are getting airplane tickets with the help of our site you are given a reduction of 15%! 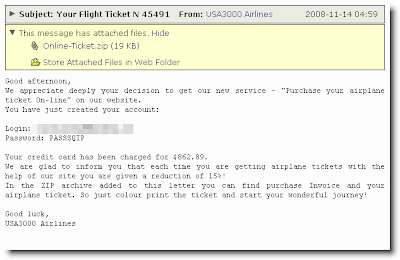 In the ZIP archive added to this letter you can find purchase Invoice and your airplane ticket. So just colour print the ticket and start your wonderful journey!